Thanks for visiting my page! I have made a few tractors that I thought I would share. To see more about the "red contraption" search for "I am not a builder!" 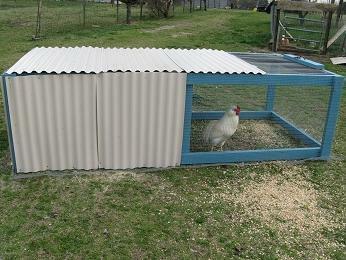 I built this one for my Barnevelders. I have also made this cute little tractor for my white Araucanas. I have only 2 birds in this one right now but am about to add another hen. 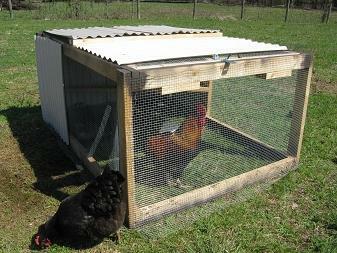 The inside coop is about 2x4 and the run part measures 4x6. I keep this going around my back yard. I love it! I have no trouble bending to get inside to close their door at night and can get to the eggs from the coop door outside. They have a roost inside and the thread is "Remember...I am not a builder." This is how they looked in the snow. The big one is the M*A*S*H unit DH built. 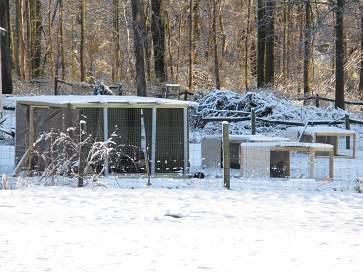 It did very well in the snow since the entire inside was protected and the chickens had a blast without ever getting nasty. They snickered at the free rangers having to get wet and gross while they were still on fresh ground but without nasty feet and feathers. 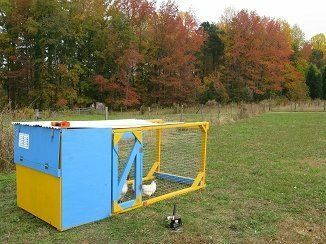 I liked it because their eggs stayed dryer in the nest boxes than my free ranging chickens and yet they still had all the benefits of free ranging. [FONT=comic sans ms,sand]The chickens did not mind being in my small Quick Pens during the snow or any rain but the wind bothers them. 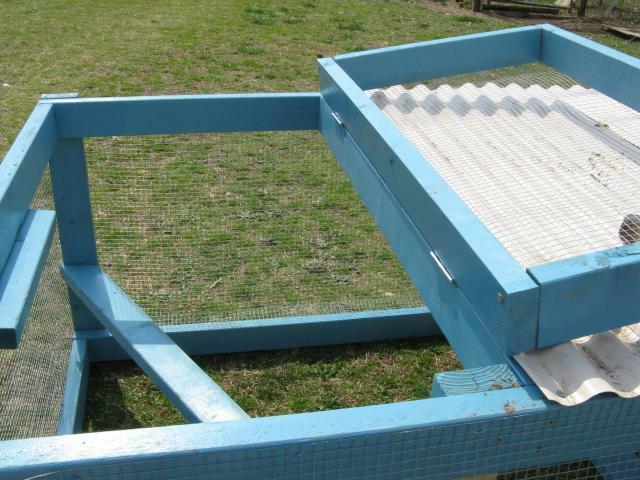 Our climate is not too bad and these are wonderful for extra breeding roos. I'm finished with yet another one of a similar design of my Quick pens. A bit larger but unfortunately heavier. I may have to put wheels on this one as I can only turn it in a radius at the moment. I have started a thread about this one and showed all the details of building it as well as my finished product. The thread is called "Another tractor story". [FONT=comic sans ms,sand]And this is what I have accomplished so far. I have the doors to put on top as I plan to have one on each end and I will be covering most of the top and the door at the back with the PVC roofing. I already see ways to improve on this design and hope to start another one after I help DH with his next M*A*S*H unit. "Good design of different tractors"
"Several designs, but not much detail"
You have a lot of ideas on how to design and make tractor coops, but you did not provide very much detail about how to actually build them. You did refer to other threads for a couple of them. 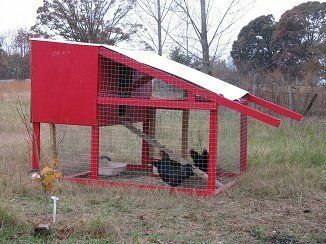 What do these coops typically cost you to make? How many birds are usually in 1 coop? You mentioned bachelor coops, so I am not sure if some of them are for just 1 rooster or for a few roosters or what.